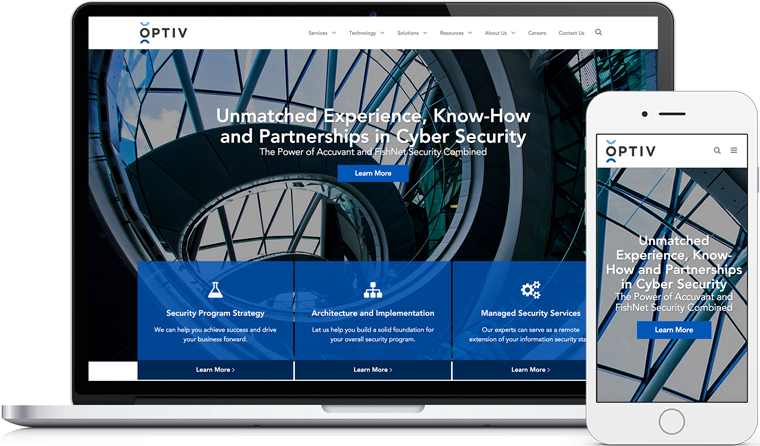 Optiv, the result of a merger between two well-known names in the field of information security (Accuvant and FishNet), is the largest holistic pure-play cyber security solutions provider in North America. Optiv is known for providing partnerships in planning, building and running successful security programs to businesses, governments and educational institutions. An established connection, we had previously worked with Accuvant. As a result, Optiv came to us in need of a new website, designed around the new Optiv brand, in a short period of time. In concurrence with today's Black Hat USA 2015 industry show in Las Vegas, we're proud to announce the launch of the new Optiv.com! 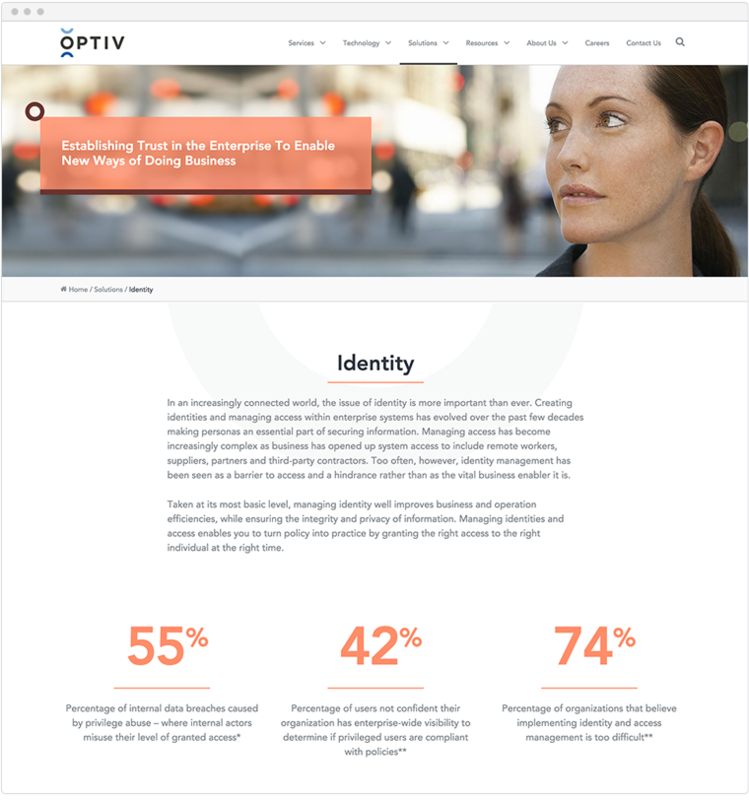 The new Optiv brand presented a need for a new public face for the company.  In two months, we worked with the teams at Optiv to produce a responsive site with an outstanding user experience. Our responsive web solution gives users access to Optiv's website and resources across all devices, and our rapid delivery met the deadline: the Black Hat USA 2015 industry show. Through Better CMS, Optiv administrators can effectively manage the wealth of resources provided for users on the site. From the perspective of the user, the resources are easily accessible in the resource library through various filters based on content type and topic. 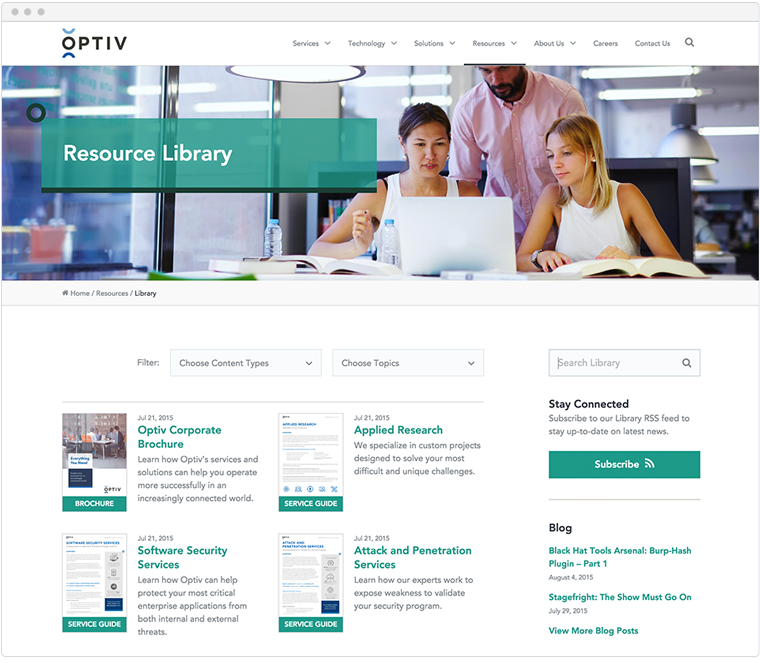 The same can be said for Optiv's highly relevant blog content, also managed through Better CMS, and readily available in the Resources area. From a content migration standpoint, we brought in content from both Accuvant and Fishnet's existing websites, again made easy by Better CMS. With a rapid deployment and rapid migration of existing content, as well as our expertise in user experience and user interaction and a Better CMS implementation, we developed and implemented a responsive website that is consistent with a new look and feel for Optiv. Check out Optiv's new website here!